Last week MRIS released its data for signed sales contracts for existing home and condos in the District during April 2009. In a nutshell, sales volume up, prices down. Despite a 13.32% increase in unit sales, dollar volume was flat, up 0.62%. Considering that 31 properties sold for more than $1MM, I interpret this to mean that prices at the market's low end are falling substantially. More homes sold [up 17.82%], but at lower prices [down 21.17%]; overall dollar volume was 2.08% lower. 22 homes sold for more than $1MM. YoY, condo unit sales were up 7.83%, dollar volume popped 16.76%. Average prices rose 8.28% to $453,037. 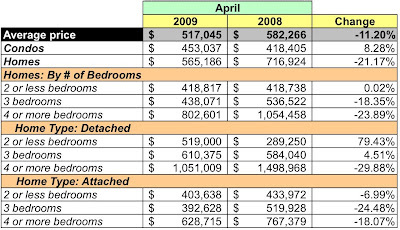 I attribute much of the increase in dollar volume and average price to the 9 condos that sold for more than $1MM. Based on March's sales volume, there is a 9.9 month inventory of condos listed [a 9.19% increase from March] and 8.34% month's supply for homes [a 7.38% decrease]. Compared to March 2008, the number of condos listed is up 3.2%, while home listings grew 4.42%. At least volume is up. Ah, yes. We lose money on each transaction, but we make up for it on volume. Keith -- Where are you getting your MRIS data from? 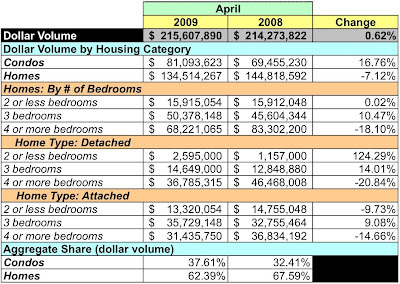 I'm looking at the 5/6/09 report for DC right now, and the April year-on-year median sales price for DC is down "just" 5.9%. I used MRIS' median sales price data and calculated the percentage decline from that - my results match theirs. To double double check that my QA department hasn't fallen asleep on the job, I just looked at the MRIS web site report for "<$100K to >$5M" and see -10.98%. In fact, I don't see any MRIS report that states the median price declined 5.9% in April. They all state -10.98%. Yeah I definitely agree with you. Key to understanding that issue, for the average person (rather than investment fund) is the relationship between real estate and the stock market in terms of risk. Nice post. I learned a lot.